Germany’s fintech landscape continues to grow with about 300 fintech companies as of late-2017 that raised a record of US$655.4 million last year. Berlin retains the position of the country’s largest fintech hub, hosting 27% of its fintech companies, followed by the Rhine-Main-Neckar region with its center in Frankfurt with 25%, according to EY. As Germany increasingly establishes its credentials in the European fintech scene, a number of regional events, startup competitions and hackathons are being held in key locations such as Frankfurt, Berlin and Hamburg. 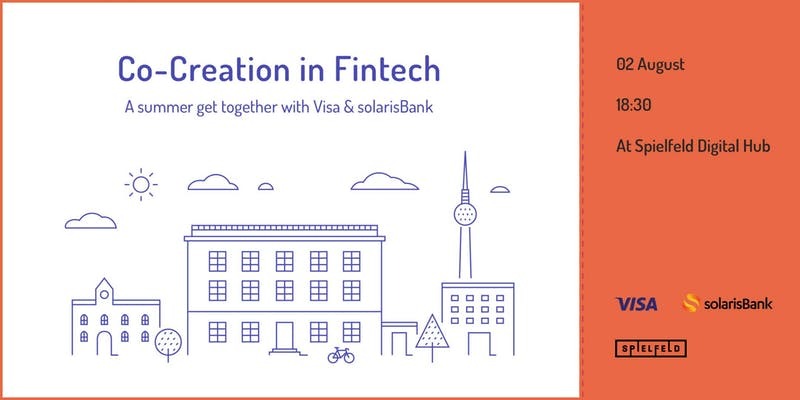 The Co-Creation in Fintech event by Visa and solarisBank, hosted at Spielfeld Digital Hub, is set to be a casual summer get-together of Germany’s fintech key players. Whilst sharing insights of co-creation processes within their organizations, Visa and solarisBank will bring together fintech startups, corporates and innovators for an evening of casual networking, tunes and delicious food and drinks. 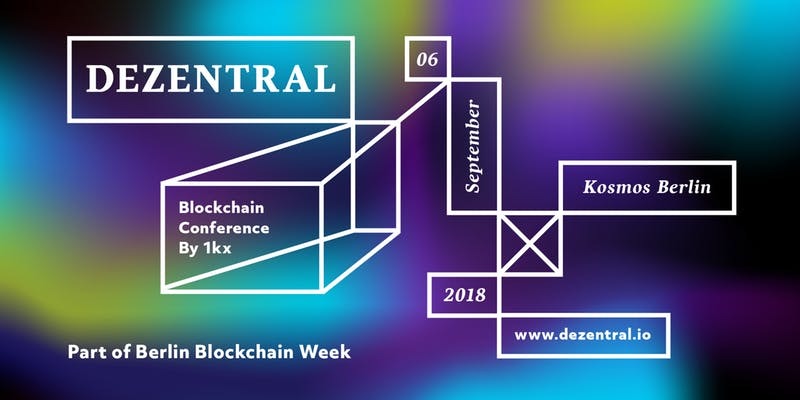 Dezentral aims to be an inclusive blockchain conference, while bringing newcomers, builders and longtime believers from all over the world together in the heart of Berlin. The event is set to feature over 50 speakers from organizations such as Tezos, Nervos, Oasis Labs, FOAM, and Zilliqa, and 800 attendees, including founders of prime projects and partners of tier 1 funds divided between two tracks. It will cover most of the blockchain landscape for 2018 onwards, highlighting and showcasing what is most interesting and exciting in the community. The Berlin HotPot Tours will guide participants to the “hot pots” of Berlin innovation chefs. These will include: the Berlin Mobility Tour, the Berlin Startup Tour, the Berlin Entrepreneurship Tour and the Berlin Financial Tour. 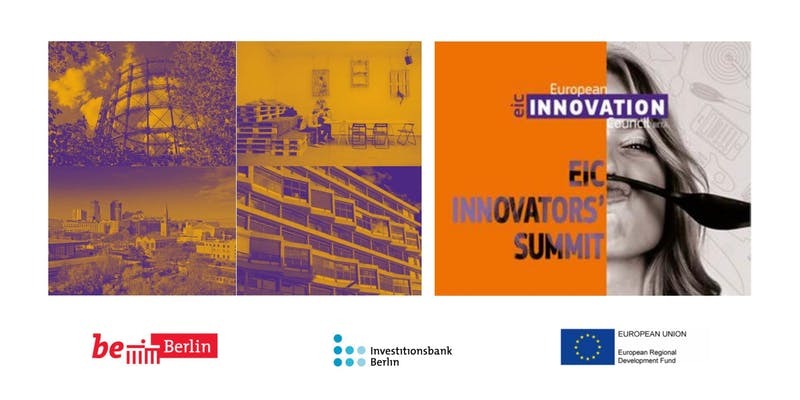 The Berlin Financial Tour will take participants to the top-level venture capital investors WestTech Ventures and Investitionsbank Berlin (IBB) as well as one of Berlin’s leading fintech hubs. Visa’s Everywhere Initiative D/A/CH is launching for the first time with a focus on German-speaking countries (DACH region). The aim of the Visa Everywhere Initiative is to promote new digital payment methods beyond the plastic card and is part of Visa’s fintech program. Participants can win prize money totaling 50,000 euros and the opportunity to become part of a funding program. Visa helps the winners to pilot new solutions and provides startups with access to mentorship and technologies, including the Visa APIs. After the closing date for applications on 20 August 2018, Visa will select up to five finalists from both categories and invite the representatives of each company to present their ideas to a jury. The finals will take place on September 19, 2018 in Frankfurt, the winners will be announced the following day. 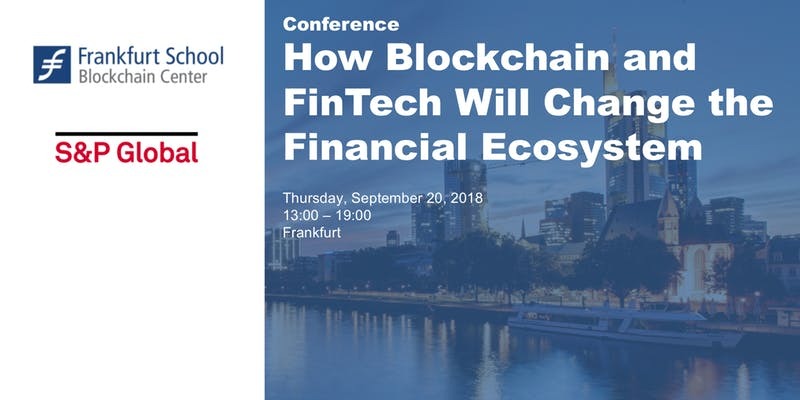 The How Blockchain and Fintech Will Change the Financial Ecosystem, organized by S&P Global in cooperation with the Frankfurt School Blockchain Center, will bring together thought leaders from the areas of fintech, blockchain, crypto assets and ICO, to shed light on the current development and growth of these markets. The focus will be laid on the perspective of how a global rating agency assesses the development of these technologies, and the implications of these new technologies on the financial ecosystem. The event will cover some of the hottest trends and topics in the sector including artificial intelligence, big data, regulation, and more. The annual Geek Girls Carrots two-day Fintech & Blockchain Hackathon (HLAG 2018) aims to engage the participants in creating finech solutions – made by women – by competing in many different challenges provided by the organizer’s partners and participants themselves. 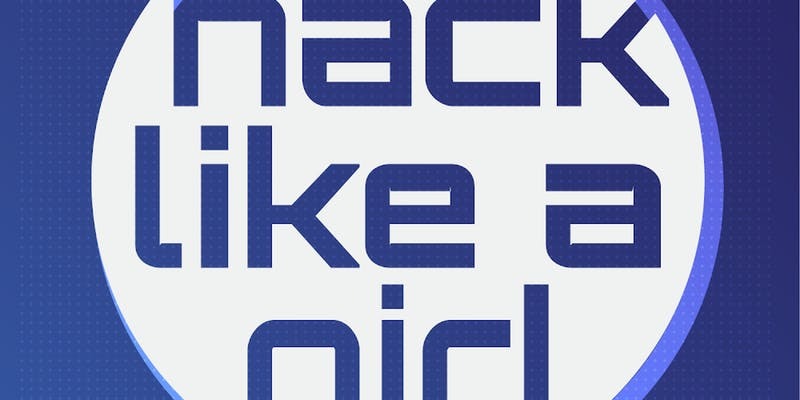 At the end of the “Hack like a Girl” hackathon, created results and prototypes will be rewarded and introduced to all conference attendees. The event is targeted at developers, graphic designers, programmers, application architects, social media specialists, system architects, and women with startup ideas. A week in Germany’s northern metropolis, rich with the best in fintech thought and innovation: Started in 2016, Fintech Week is the annual event that brings together aspiring newcomers, fintech professionals, and established players from banking and insurance to discuss the future of finance. From October 15 to 20, 2018, visitors from Germany and beyond will meet in more than 30 different set-ups, including conferences, barcamps, expert panels, guided feedback sessions, meet ups, and other networking settings. The Payment Summit promises to be one of the largest payment business events for retailers and the financial sector. This year, the conference will focus on the many developments in the fintech sector, including mobile payments, real-time payments, bitcoin services, the Alipay ecosystem, and the PSD2 directive. 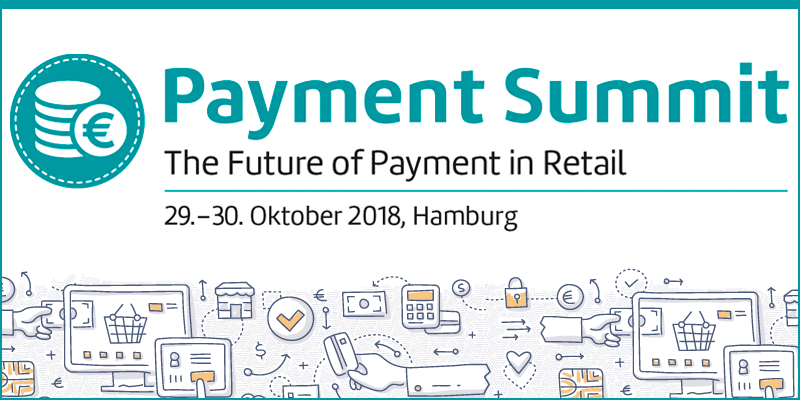 On the first day of the conference, retailers will learn about trends and strategies on how to optimize their payment processing and what innovations are worthwhile. The second conference day will feature lectures and discussion panels. The Euro Finance Week 2018 is a multi-day event covering the latest developments in the European financial industry and the hottest trends in the space. Key conferences and sessions will include the Visa Innovation Forum, the Award Ceremony for the European Banker of the year, the Cyber Risk, Regulation and Technology conference, the Euro Finance Tech conference, European-Chinese Banking Day, the Green Finance Forum, and more. 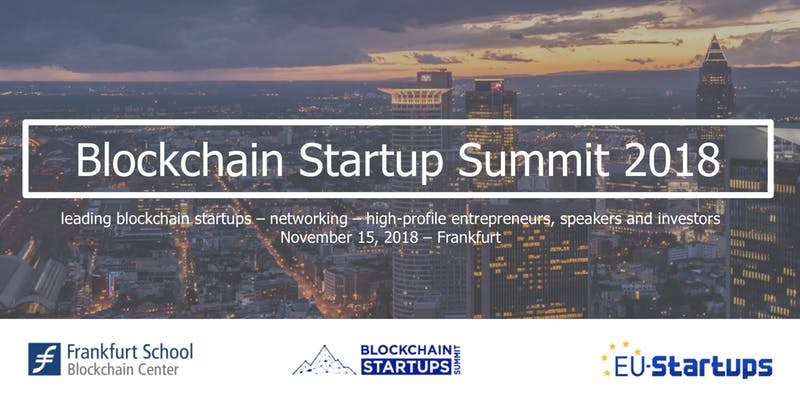 Blockchain Startups Summit 2018 is a jointly organized event by the Frankfurt School Blockchain Center and EU-Startups. The event is set to bring together more than 300 entrepreneurs, investors and blockchain technology service providers from across Europe. The event will showcase a pitch battle for a selection of the hottest European blockchain-based startups with a prize package worth EUR 10,000. It will also count on the participation of high-profile entrepreneurs and investors among the speakers, and will feature panel discussions, talks, and presentations by startups that are active in the field of blockchain. The EBR – European Banking Regulation conference will cover the latest regulatory issues and feature renowned experts from the ECB, EBA, Deutsche Bundesbank, BaFin, SRB and representatives of the credit industry and various associations. Among the key topics, the event will cover the different regulatory projects in the pipeline and what their implementation status is, the impact of regulation on business models, the emergence of regtech, regulation of fintech companies, and more. The Fintech Forum, launched in 2013, is one of the first and largest hubs for fintech in Continental Europe, with a network of 12,000+ industry participants. The 17+ events have brought together 270+ startups on stage in front of 1,000+ investors and financial institutions. Alumni have gone on to raise US$310 million + in funding and resulted in exits worth US$300 million + as of end-2017. The 10th Fintech Forum seeks to identify innovators, disruptors and “hidden champions” in the financial services sector, and bring them together with investors and financial institutions. Participating companies will include Bita, CrowdDesk, Earlybird Venture Capital, Forexfix, Growney, Miles & More, Neon Banking, Imburse Payments, Innogy, InvestHK, Smava, and Yabeo (VC). The post 12 Upcoming Fintech, Digital Finance and Blockchain Events in Germany to Attend appeared first on Fintech Schweiz Digital Finance News – FintechNewsCH.